The gong is an ancient sacred instrument used for healing, rejuvenation and transformation. A gong bath is a luxurious way to take in the vibrational patterns of sound while deeply relaxing. When you are immersed in the strong and powerful sound waves of good gong playing there is a physiological shift in your nervous system and subtle energy channels. 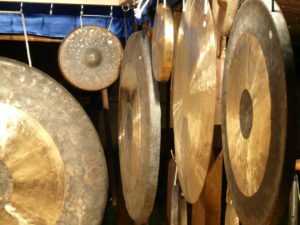 A gong bath can be the most relaxing and effortless way to meditate, but requires a skilled player to capture and send out the healing vibrations of the sounds. Yogi Bhajan, master of Kundalini Yoga, taught that the gong is no ordinary instrument- it is the sound of creation, the sound of the Universe. “The sound of the gong is the nucleus of the Word. The gong is a beautiful reinforced vibration” that penetrates deeply into all the cells of your body and psyche. “There is only one thing that can supersede and command the human mind, the sound of the Gong” Yogi Bhajan. What are the Benefits of a Gong Bath? The parasympathetic nervous system is ruled by sound, the sympathetic by vision. It is the sympathetic system that needs to be regulated, and by stimulating the parasympathetic system, this is accomplished. When the parasympathetic system is weakened by stress or disease, the Gong is a powerful way to regenerate and restore it. In yogic anatomy, there are subtle nerve channels called nadis. Nadis are similar to the meridians used in acupuncture and other Eastern sciences. More subtle than your nervous system, the nadis carry prana, the life force energy. Just as your nervous system gets out of whack when you’re under prolonged stress, the nadis can become blocked so that energy doesn’t flow properly. The two primary nadis are the pingala (sun energy) and the ida (moon energy). The central nadi, the sushaman, is the main energy channel through the body. Vibrational music of the gong readjusts these important energy channels. The seven chakras, common to most yogic traditions, are energy centers that align with the spine, beginning at the base and going to the crown (and beyond). Each chakra resonates with specific sound frequencies. The gong produces “seed” sounds which stimulates the chakras as different tones are generated. 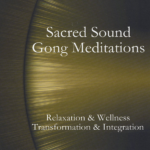 If you’d like to learn more about the theory gong healing, I recommend Gong Yoga: Healing and Enlightenment Through Sound by Mehtab Benton. If you think you’d like to learn to play the gong, this is a great resource to get started. Quality gongs can be quite expensive and there are different gongs with different frequencies. In other words, if you’re just getting started you may want to start with the CD’s listed above or find a local class that incorporate gong baths. You can either take a class where a gong bath is incorporated, if there is one nearby you, or you can take a gong bath in the privacy of your own home by using recorded gong music. It is better to listen to a professional recording that is developed for sound healing rather than a poorly played gong. 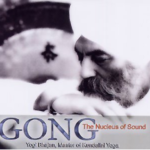 Listen to Yogi Bhajan play the gong as you surrender to the experience and let go of all tension. 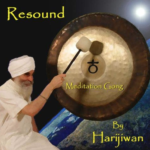 Harijiwan, as seen in the video above, teaches and plays the gong all over the world. Todd Glacy creates a mystical pathway using sound and spirituality. Body Posture: Sit in easy pose, in a chair, or bed; maintain a straight spine. Legs may be stretched out in front if done in bed. Mudra: Relax the arms and elbow, place the palms face down on the knees. Eye Focus (Dhrist): Close your eyes and gently look up to your brow point (the point between the eyebrows). Mantra: Focus on the vibration of the Gong. 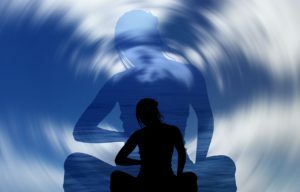 The Meditation: Allow the breath to become slow and meditative, gradually allow it to become lighter. Allow yourself to surrender to the sound of the Gong. End: Inhale deeply and relax. Cover yourself with a blanket (if appropriate) and get comfortable. Maybe a yoga bolster under your thighs if you have lower back challenges. Lie in Savasana (resting or Corpse pose) with your arms out to your side, palms up. As the gong music begins, relax into it. You may experience some resistance–don’t tighten up your muscles! Surrender to the experience. If emotions come up, let them flow! Don’t suppress the tears or the laughter should that be your experience. Relax into the gong bath for at least 10-15 minutes. You may want to build up slowly, but if you have the time, go longer. After your gong bath is over you may want to meditate, journal, or just have a big glass of water. I highly recommend journaling your experience, because the experience may be subtle (or not so subtle) and the benefits will be noticeable over time. As the founder of How To Relieve Stress Naturally, I have been on my own stress reduction journey for a number of years, and as part of this process I like to follow where my passions lead me and then blog about them. There are affiliate links in this review and on other pages, which means I earn a small commission if you order the product through my link–with no additional charge to you. If you have a passion that you have considered blogging about, check out the platform that I use. 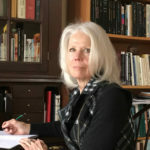 I am happy to be doing the work that I love and sharing my research with others–now that’s freedom.